I know I promised a final follow-up to the jobs report on Friday, but frankly, it was 72 degrees in NNY so I was officially offline for most of the weekend. 1) The jobs report - While most were tripping over themselves to praise the jobs report, I'll offer you some objective observations. The payroll number looked good on the surface - +162,000. Adjusting for census jobs you get 114k still good. The positives: the unemployment rate was steady, the employment-population ratio ticked up slightly. The negatives: a near record number of part time workers (for economic reasons), a record number of unemployed for more than 26 weeks, and a decline in average hourly wages. There were also the typical gains in the birth/death model which is pure fantasy, but why mess with a good story, right? All in all, I think the BLS got a great deal of positive press out of this release b/c the markets were closed on Friday. "There is, for example, the woman who bought a $600,000 house, claiming she worked as an account exec at a California investment firm, earned $13,494.03 (nice touch that three cents) a month, had a $45,000 bank account at Wells Fargo and, according to the insurance application, made a $30,000 down payment. When MGIC nosed around, it discovered the investment firm she supposedly worked for didn’t exist, neither did the bank account, she hadn’t made a down payment and she actually earned $3,901.58 a month as a janitor at a medical facility. In another instance, a $350,000 loan was extended by Countrywide to a fellow who wanted to buy a home valued at that amount and claimed he was a dairy foreman earning $10,5000 a month. Again, the snoops at MGIC discovered the guy was a milker at the dairy who earned $1,100 a month and signed the documents where he was told to — even though he couldn’t read English." 3) Since we all have healthcare now (without any of those unsightly taxes to pay for it) it's time to get down to business and really starting clogging our arteries like we mean it. 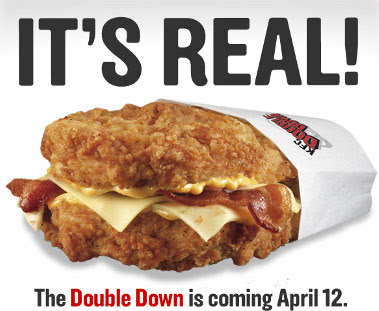 KFC is launching the "DOUBLE DOWN" on 4/12. Two pieces of fried chicken which act as the "bread" and a lovely filling of cheese and mmmmmmmm, Bacon. The name of the "sandwich" - Double Down is very funny. If you're 44 with a BMI of 38 and tired of all that "healthy eating talk", why not just double down. Finally, I'm not normally a shopper. In fact, I hate shopping so much I've been known to do my grocery shopping at 10pm on a Sunday night to avoid the crowds. However, this Saturday the stores I visited were absolutely mobbed. Old Navy was selling their disposable polos for $5(I defy anyone to wash one of those shirts and try to wear it out in public a second time). This was down from $9 and still about 300% overpriced, but each of 4 registers in Watertown had at least 10 customers lined up. I might end up being pleasantly surprised by the American consumer again.